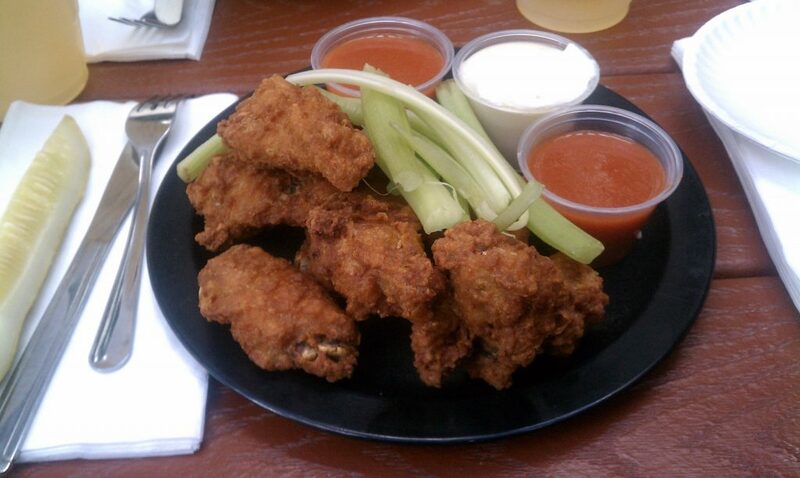 I received a “Suggest a Joint” from Mimi the other week who told me that I needed to head down to the Oaklyn Manor to grab some great wings. Being that it was Father’s Day, my family decided to take this opportunity to give me the best present a man in my situation could receive… a Buffalo wing dinner. I’m not one to argue with family, so if they tell me I need to eat wings, by golly, I’m eating wings…. I do it for the children! So we jump in the car and swing on into Oaklyn to see what all the fuss is about. It was a gorgeous day outside and the sun was shining as we pulled into the lot. The Manor has a small bar upfront, but if you’re dining with children like I was, you might want to head toward the back. This is where they have a nice deck/bar area and plenty of outside seating, which was perfect for this type of day. The kid’s seats were getting a little warm with the sun, so after they made us play a couple of rounds of musical chairs to find some shade (seriously, I almost sat down at about four different tables), we finally took our seats and ordered our food. The wings only come one way so that’s what I grabbed along with some kid favorites such as the Hot Dog and Grilled Cheese to keep the little ones smiling. The price was fantastic for the wings as I consider anything under $7 a steal these days. But once again, when the food arrived, I began to see why they were so cheap…. the size. The wings were so delicious looking but were also so incredibly small. This is disappointing because even if the wing is great, it loses its value when you decrease the size. Think of it in terms of a candy bar. If you unwrap a Snickers only to find a “fun size” bar inside, you would be left feeling gypped. I think if a restaurant uses tiny wings, then that place should add more to the plate to compensate. Either make it 9 larger wings or 13 small wings so they have the same chance to fill me up. After accepting the size and moving on, I looked at how beautifully these things were breaded. They come out dry and require the customer to sauce it themselves (I assume this is to keep them crispy all the way to the table, as I know a few people who order them this way for that reason). And crispy they were! These wings had such a crunch to the skin it made me feel like I was in good hands with this chef who knew how to use a fryer… and it showed with every bite I took. The shell that was created kept the chicken nice and juicy on the inside which helped keep a nice tenderness throughout the meat. Even dry, there was some decent flavor to the wing, but I wanted to see how it held up when coated with the sauce, which was just a Frank’s Red Hot. I poured it on and waited for the breading to start absorbing the liquid thus turning it to a soggy mess. But that never happened, and the wing kept its integrity until the very last bite. Overall you can tell that I was very excited about the crispness of the breading, but it was the size and lack of a unique sauce that left me wanting more. I am a big fan of Franks, but I am a picky person looking for the complete package – and that includes originality. That doesn’t mean that these wings weren’t good, it just means that with the help of some subtle changes, these wings could be great. However if you prefer Frank’s, stop in, try them out, and let me know what you think – just make sure you order the double. Extra bonus: my kids left happy, and that’s really all a Dad can ask for on his special day.